Delhi with mesmerizing monuments, forts and mosques has unique charms and splendid history. It is incredible to explore rambling Old Delhi and beautiful New Delhi and the immense contrast between them is amazing. Spend your time here and relax in blooming gardens of Delhi. New Delhi.net suggests you following top attractions that can make your stay memorable. Red Fort is commonly known as Lal Quila and is built by Mughals. Red Fort attracts large number of tourists every year as it is the largest monument in Old Delhi. On the eve of the Independence Day of India on 15 August, the Prime Minister of India addresses the nation from this very fort. Spend your time here and get the feeling of heaven, calmness and peace all around. Jama Masjid being the largest mosque in India is a marvelous treasure of Delhi. Take a glance to the stunning roof tops of Delhi as you climb to the top of the Masjid’s southern tower. Chandni Chowk is chaotic, crumbling, congested, but captivating at the same time. This jostling street of Old Delhi presents a sharp contrast to the orderly, wide streets of New Delhi. You will find inexpensive jewelry, electronics, apparel and Delhi’s famous street food -chaat papdi, golgappas and you will enjoy Dilli-ki-Chaat in Chandni Chowk. If you’re feeling tired and worn out then Lodi gardens is an ideal place as it provides a serene retreat from the noisy street life. Joggers and yoga practitioners enjoy this park. Another peaceful place to the hustle and bustle of the city is the garden of five senses and it is no ordinary garden. It will awaken your five senses. Plants, flowers, waterfalls, rocks, quirky sculptures, murals, ceramic bells and spiral walkways present a specific design. Qutab Minar is one of the fine examples of Afghan Architecture. It is the tallest minaret in India and is constructed with red sandstone and marble. One has to go up 379 stairs to reach the top and it has five distinct storeys. Several medieval and ancient structures surround the minar which as a whole is called as Qutab Complex. Ever year in the month of October/ November a festival known as The Qutab Festival takes place. However the minar gets overcrowded on weekends. So don’t forget to spend your weekend here! 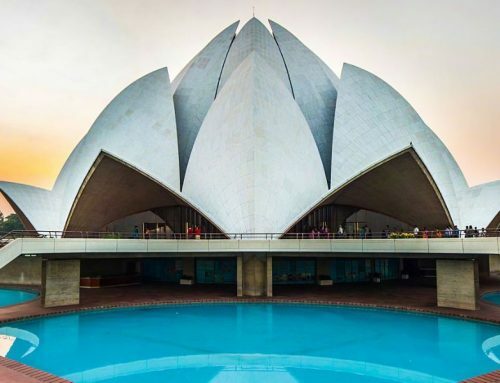 This lotus shaped temple is the Bahai Temple. This temple is particularly pretty at night. For a relaxing picnic the tranquil gardens and ponds surrounding the temple are just a treat. India Gate lies in the heart of New Delhi. It is the national monument of India, made up of red and pale sandstone and granite. 90,000 soldiers from India lost their lives fighting the British during various wars which are what India gate symbolizes. Here you can spend your whole day by watching monkey performance, playing with balloons, riding a camel or you can taste some typical fast foods including bhelpuri, chana jor garam, Aloo Tikki and the list goes on!